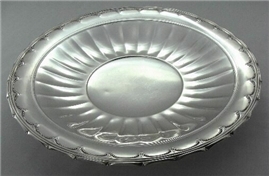 Handsome sterling silver circular, footed plate in the Old Colonial pattern by Towle. The diameter is 12"; the height is 1 5/8"; the weight is 17.35 Troy Oz. The condition is wonderful, albeit a teeny impression, best seen by the reflection of light.